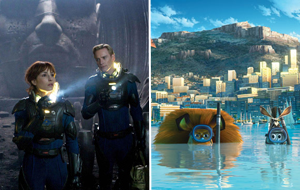 We've added Prometheus and Madagascar 3: Europe's Most Wanted to our Long Range Forecast this week. Both films are scheduled to open in wide release on Friday, June 8. This will mark the third straight year in which a revival of 1980s cinema has debuted on the same June weekend. Acting as J.J. Abrams' tribute to classic Spielberg films, Super 8 opened to $35.5 million on June 10, 2011. The previous year saw Sony's remake of The Karate Kid debut to $55.7 million on June 11. - The online community is in love with the trailer. - Seems to have great potential for pleasing audiences, while also being a critical favorite. Holding power could be strong for the genre, especially with no direct competition for adult audiences until The Dark Knight Rises releases in late July. - Early marketing campaign blends subtle nostalgia for the core fan base with "event-level" promotion for everyone else. Being tied into the Alien universe -- but not a part of the Alien franchise itself -- is a good way of getting fans excited without carrying the baggage of the later films of the series. Star Trek achieved a similar feat with its re-branding back in 2009. - Fox had good results last summer with its Planet of the Apes and X-Men re-launches. Even if this technically isn't a re-launch, it has the feeling of one. - Alien Vs. Predator opened to $38.3 million eight years ago. With price increases and a 3D bump for Prometheus, the same number of ticket sales would generate a $55 million opening. - The presence of Noomi Rapace and Michael Fassbender helps the project's "cool" factor. Both stars have cult followings. - The online community is in love with the trailer. This could be over-hyped by genre fans. - Will be more dependent on word of mouth and reviews to attract casual moviegoers after opening weekend, which is never a guarantee to happen. - Even in its glory days of Alien and Aliens, the franchise was never quite as big as other high-profile series. - Could have a tough time bringing in patrons who don't normally flock to sci-fi flicks -- women, in particular. - Obscure marketing has to be managed well enough to avoid feeling too esoteric for average moviegoers. - This is the first computer animated film since The Lorax and the first half of 2012 hasn't been flooded with computer animated films like the first half of 2011 was. The family audience will have been somewhat under-served come mid-June. - When it comes to summer entertainment, families aren't always picky about quality. See The Smurfs, which grossed $143 million despite very poor critical reception. - Kung Fu Panda 2, Cars 2, and Happy Feet Two all dropped off from their predecessors last year (despite the addition of 3D). - Franchise fatigue typically sets in for all franchises after the first disappointing sequel comes along. Animated series aren't immune to this, and Madagascar 2 didn't even triple its opening weekend gross -- an indicator of subdued word of mouth for an animated family flick. - Opening two weeks before Brave is very likely to increase the chance of front-loading. - Again due to poor reception of its predecessor, Shrek Forever After (despite adding 3D) plummeted over 40% from Shrek the Third's opening weekend and over 25% in terms of the final gross. Madagascar 3 may be in a similar position. Chernobyl Diaries May 25, 2012 Warner Bros. Dark Shadows May 11, 2012 Warner Bros. The Lucky One (2012) Apr 20, 2012 Warner Bros.
Phil Contrino, Daniel Garris, Alex Edghill and Shawn Robbins contributed to this article.